In the 70’s and 80’s, RPG box sets with booklets were all the rage. In recent years, many game publishers have shifted to publishing 200+ page RPG hardbacks instead of the much-beloved booklet format of prior years. Hardbacks have a great shelf-life, but many of us miss the convenience of smaller books which have streamlined mechanics and easily lay flat on the game table. 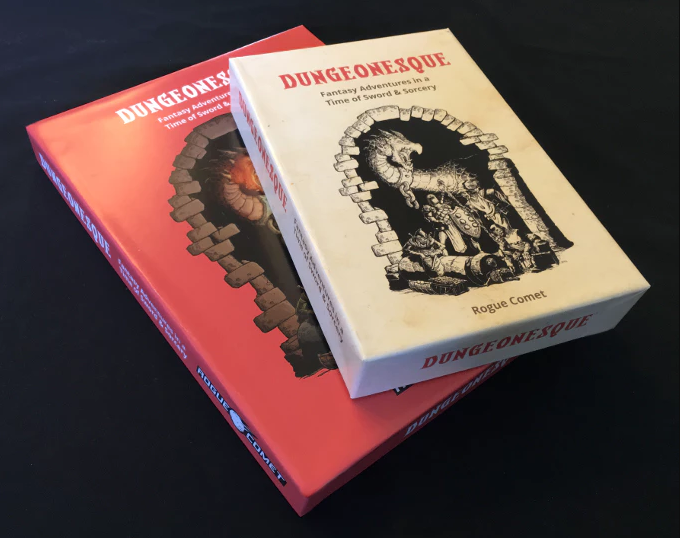 The Dungeonesque RPG is a new role-playing game that is fully 5e compatible but optimized for old-school play. There are two versions you can choose from which have different booklets sizes. Each version will contain the same text content but packaged differently to fit the different booklet sizes. Both versions form a complete RPG system that is fully 5e compatible and can advance characters up to level 15. View more about these products on Studio 2 and DriveThruRPG.